Got his recipe from Butter Me Up Brooklyn. It was more difficult than I usually go for but with Ed’s help it was more than manageable. 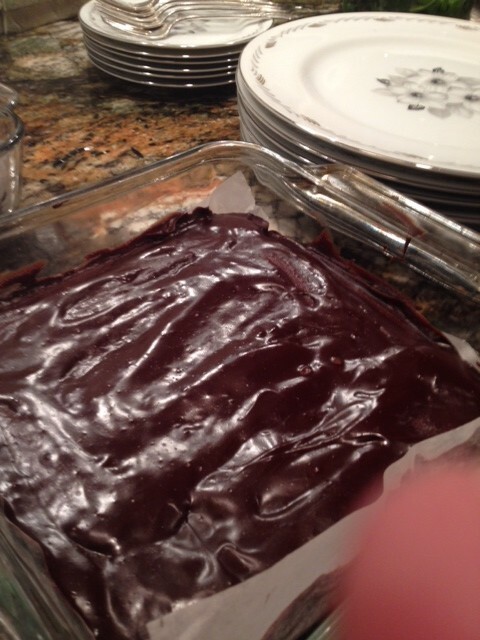 Loved the way the chocolate and red wine worked out together, as did my dinner guests, and will definitely make again! My changes are in italics below. While the brownies are baking make the glaze. Melt the chocolate in a heatproof bowl set over simmering water until melted. Add the butter, wine and salt and whisk until smooth. (Put it all in microwave, 30 second intervals at 50% power, stirred in between, done in about 2 minutes.) Pour the glaze over the warm brownies and spread it to the corners so the top is evenly coated.